Technology and biotech shares have been the focus of investors over the last year and have outperformed the market, however that has begun to change as many firms in the energy sector have begun to attract attention from investors. 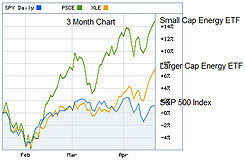 Small capitalization energy companies, represented by the Powershares S&P Small Cap Energy Portfolio (PSCE) ETF, while more volatile (hence more risky) have substantially outperformed the S&P 500 Index in the first quarter. Likewise the Energy Select Fund ‘XLE’ ETF, a larger capitalization energy portfolio, has also performed well compared to the S&P 500 Index (see chart above). In another indication of this trend, Southern Methodist University undergraduate School of Business students in a capital allocation contest saw 14 of their 17 energy sector portfolios outperform the S&P 500 Index over the last 11 weeks, most substantially outperforming the benchmark. 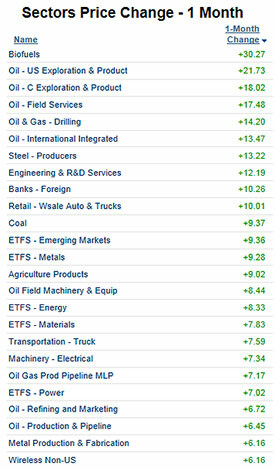 The top performing 25 sectors measured by price performance over the last 30 days (of the 110 tracked by Barchart.com) include 13 related to the energy sector (see table courtesy Barchart.com). The current ‘market rotation’ into the energy sector might be much more powerful, and last much longer, than many expect for the reasons set out below. None other than super-investor Warren Buffett has made major investments in companies in the energy sector over the last few years. Investing in Exxon-Mobil, MidAmerican Energy, Suncor and BNSF he apparently finds the opportunities for generating excess returns compelling. A law professor at Cardozo University named Lawrence Cunningham published an article in their law review several years ago entitled "The Essays of Warren Buffett: Lessons for Corporate America." In the article he reviews Mr. Buffett's Berkshire Hathaway annual reports and other communications in an attempt to identify why he has been such a good investor and the strategies he utilized to deliver excess returns to his investors. Buy a Good "Business Boat" — Buffett points out probably the most important factor to consider when determining whether to invest in a company is whether the firm is well positioned in a growing and profitable industry. He identifies his largest investment mistake — buying the small company his firm was named after (Berkshire Hathaway) — not because the company was flawed, but because the industry it was in (textiles) was so unattractive. The company was cheap by most valuation metrics, but there was a good reason. The textile industry provided very meager returns for Berkshire. No matter how well managed the company was it would always have subnormal returns. The textile industry was a commodity business, competitors had facilities located overseas that were low cost producers, and substantial excess capacity existed worldwide. Buffett notes "a good managerial record (measured by economic returns) is far more a function of what business boat you get into than it is of how effectively you row. Should you find yourself in a chronically leaking boat, energy devoted to changing vessels is likely to be more productive than energy devoted to patching leaks." Inefficient Markets & Small Companies — Buffett subscribes to the theory that the market is not always efficient, and that at certain times companies will be grossly undervalued or overvalued. The market allows an astute investor to buy positions in companies well below intrinsic values. In the long term, such value will be recognized. "An investor will succeed by coupling good business judgment with an ability to insulate his thoughts and behavior from the super-contagious emotions that swirl about the marketplace. The speed at which a business's success is recognized is not that important as long as the company's intrinsic value is increasing at a satisfactory rate — in fact, delayed recognition can be an advantage: It may give us the chance to buy more of a good thing at a bargain price." Few people realize that during the period Buffett managed his partnership he focused on small, relatively illiquid, microcap firms. Such companies were more likely to be mis-valued, and more likely to contribute to the growth of shareholder value. Advantages of Compound Returns & Tax Structure — One reason that investors in Berkshire stock did so well was that their investment was compounded and their capital gains taxes were never realized or delayed until the stock was sold. "Tax-paying investors will realize a far, far greater sum from a single investment that compounds internally at a given rate than from a succession of investments compounding at the same rate. 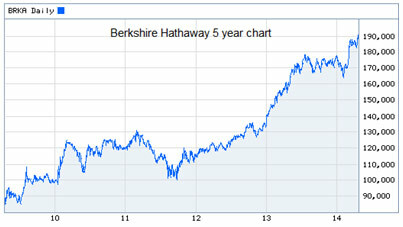 But I suspect many Berkshire shareholders figured that out long ago" according to Buffett. Likewise, a well performing portfolio of stocks allows assets to grow tax free — until the stock is liquidated and the appropriate taxes are paid. Buffett notes that capital gains taxes are generally much lower than income taxes for most investors. So it is easier to build wealth with stocks than by increasing one’s income (which is taxable annually at progressive rates). Concentration of Investments — Professor Cunningham notes that "contrary to modern finance theory, Buffett's investment knitting does not prescribe diversification. It may even call for concentration — a strategy of financial and mental concentration may reduce risk by raising both the intensity of an investor's thinking about a business and the comfort level he must have with its fundamental characteristics before buying it." Other articles have noted the tendency of Buffett to concentrate his investments, and claim that this is part of his success. If nothing else, concentration allows an investor to follow a company much more closely — which allows them to better judge when a stock is undervalued. A number of trends exist in the energy sector, both long term and global in scope, which make some parts of the business very attractive for long term investors. Some of the trends that make the energy sector a ‘good business boat”, including recent developments, are discussed below. Due to the operational flexibility we think operators will choose to sell into markets where their returns will be highest, after transportation costs, which most likely will be on the Gulf Coast. Cushing inventories will stabilize, but only after pricing signals give producers a reason to sell into that market. This is a longer term trend, not a short term aberration. WTI/Brent Spread Narrows — As crude oil is moved to the refineries on the Gulf Coast the ‘spread’ between the West Texas Intermediate (WTI) price (usually a bit lower) and Brent crude pricing has narrowed — and most likely will continue to narrow as producers have more flexibility to sell into various markets. U.S. producers in the mid-continent should obtain higher prices for their oil and liquids production under this scenario. U.S. Refined Exports Surge — With the deluge of crude oil from domestic U.S. producers as they ramp up production from unconventional shale resources, and due to restrictions on exports of crude oil which restrict foreign sales, U.S. refineries have been producing a ‘tidal wave’ of fuel for export. Due to natural gas prices that are one-third the price of European markets, electricity which is one-half the price, and the discount obtained on U.S. crude feedstock it is cheaper to refine diesel fuel in Houston, ship it to Europe, and sell it in the European market than it is to refine it in Europe for local sale. As a result a dozen European refineries have been closed or ‘mothballed’ over the last several years. The financial disadvantage faced by European refineries continue to place those facilities at a severe disadvantage. While weekly exports of U.S. crude oil have been flat for the last thirty years (see chart below), the exports of U.S. petroleum products has rocketed upward over the last five years as the unconventional shale revolution has progressed. Imports of crude oil products have also declined in the face of a robust U.S. refining sector and cheap refinery feedstock. Charts below prepared with EIA data. Demand Pushing Crude Prices Upward — In the face of higher global demand, even the accelerating production from U.S. shale basins have not put a major dent in the price of crude oil. The trend remains upward. The fact that we are seeing robust prices in the second quarter of the year, the period during which global demand is generally weakest, bodes well for upward price trends in the summer and fall. Arab Spring Becomes Arab Winter — Production interruptions continue in Venezuela, Nigeria, Syria, Yemen, Libya, Egypt, Iran, and to some extent in Iraq, which has reduced the global ‘spare production capacity’ available to address potential additional supply interruptions. The Energy Information Administration’s estimate of spare capacity can be seen in the chart below — it is clear that spare capacity has fallen from the 2009 to 2011 period. Studies on unrest and crude oil production interruptions have found that the ‘hot spots’ of instability tend to be where rising food costs intersect with corruption and ineffectual government. Food prices were cited as a trigger for the Arab Spring uprisings, and more recently for the unrest in Venezuela. Drought in the U.S. could make 2014 one of the more volatile years for food prices and supplies globally, with the main culprit the parched land of California's Central Valley. Conditions are so dry that some farmers aren't even bothering to plant. That might have even bigger implications for food prices than the 2012 drought that baked the Corn Belt, U.S. Agriculture Secretary Tom Vilsack said recently. Higher global food prices could add additional fuel to Middle East/ North Africa instability and unrest. Keep in mind that proved oil reserves, in politically secure areas, most likely will become more valuable in the face of ongoing global unrest in oil producing regions. The ‘risk discount’ placed on non-North American or European production continues to increase, and operations in many Middle East and North African areas are becoming more difficult, costly, and less secure. Producers & Governments Need High Priced Oil — In a recent report the Chief Economist at Deutsche Bank, noted that almost every OPEC exporter needs $100 per barrel or better crude oil prices to balance their budgets. With the Arab spring governmental expenditures have been substantially increased to keep the populace contented. Venezuela requires $121 a barrel to balance their budget, Nigeria $118, Bahrain $135, Russia $102, and Saudi Arabia $94 a barrel according to the report. In addition, due to the cost of developing unconventional shale formations, many producers in the U.S. also need robust oil prices to maintain their capital expenditure levels. Should oil prices fall to $75 a barrel or below the amount of drilling and developmental activity would be rapidly impacted according to several studies. The steep production decline curves for unconventional shale resources would tend to quickly reduce global supply once development is curtailed. U.S. Natural Gas Inventories Stunningly Low — Natural gas storage is at an 11 year low according to the EIA, with storage levels roughly two standard deviations below normal. Note the EIA projects an injection of 2,500 billion cubic feet (bcf) between now and November — a record amount. Even if this gas is injected into storage inventories will be well below the 5 year average at the start of next winter. Natural gas utilities are required by regulators to maintain gas in storage to meet winter heating demand, and as the spring progresses might be pushed into the gas market more forcefully than they now expect. Natural Gas Demand is Growing. 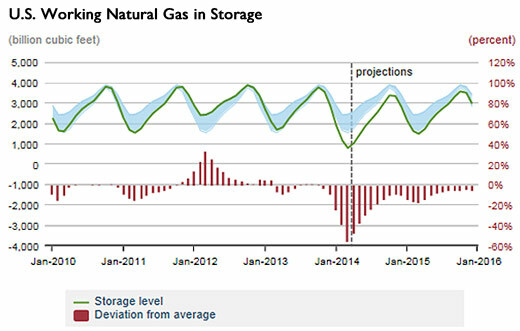 What has changes since the last time storage levels were this low a decade ago is the fact that demand for natural gas has grown consistently due to the environmentally friendly nature of the fuel and the recent pricing incentives versus other fuels. Regulations impacting coal plant emissions, a drought in the west limiting hydropower, and several nuclear power plants offline for extended periods will further drive natural gas demand upward this summer. Charts below from EIA data (2014 estimated) — note the persistent demand trend upward. 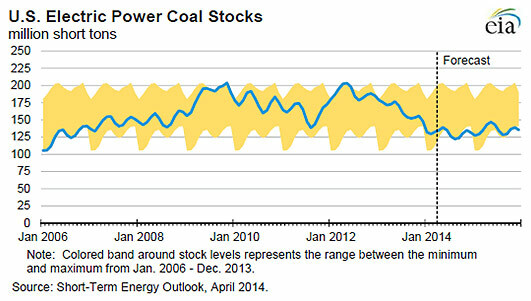 Transportation Delays Impact Coal Generation — Due to weather induced delays in train shipments, and the fact the Great Lakes are for the most part still partly frozen over and early spring coal shipments which normally have already been delivered are waiting for the clear waters, the amount of coal on-hand at utilities is at five year lows (see EIA chart below). Transportation problems also exist for grains, ethanol, and fertilizer shipments — and the untangling of the transportation bottleneck will take some time. Some railroad experts predict it will take most of the summer for the train shipments to normalize — if so the ability of coal fired electric plants to assist in meeting peak summer electric demand might be compromised to the benefit of natural gas generation. Long term trends are in place making the energy sector a ‘good business boat’. Due to market inefficiencies, and the small size of many energy companies, it can be argued that many are mispriced — some grossly so. One public firm reviewed by SMU students just filed their annual report — the company had a discounted present value of ‘proved’ reserves under SEC rules (10% discount rate) of $7.52 after debt, and traded at $1.30 a share — certainly the market would not appear to be ‘efficient’ when such discrepancies exist. The gap in value and price could be considered a ‘margin of safety’ for investors, assuming the assets could be developed. With regard to valuation keep in mind the discounted present values of proved reserves are calculated by third party registered professional engineers under strict SEC rules and guidelines. And in today’s low interest rate environment a ten percent discount rate is well above the risk-free rate, and arguably the discount rate used should be much lower. The present value of the cash flows from production are inversely related with the discount rate used, so at a lower discount rate the asset value increases (sometime substantially). Assets located in the U.S. will be in a politically secure environment, and developments in transportation should give producers additional flexibility to sell in the most attractive markets available. U.S. refiners should see their cost advantage maintained, and exports of refined products should continue to increase. Firms involved in transportation services to the energy sector should see demand continue to increase. Additionally, refinery and petrochemical plant expansions should continue to fuel opportunities for engineering management and consulting firms. Running a screen of fast growing energy firms in the energy sector — companies that are increasing revenues (hence production and reserves in most cases if they are a producer) we find some interesting smaller firms (see table below). Note that the median revenue growth over the trailing twelve months for these firms was 100%, well above the roughly 2% revenue median growth seen by firms comprising the S&P 500 Index. Note also that many of these companies are smaller (hence in the more inefficient part of the market). Larger firms, due to their size have had difficulty in increasing production and reserves (the largest firms, like Exxon and BP, have seen capital costs increase substantially also, without corresponding production increases). As Mr. Buffett has noted capital gains taxes allow investors to generally reduce their tax burdens by delaying the sale of their shares, timing the recognition of profits, and obtaining the advantage of lower capital gains rates. The energy sector is quickly becoming a compelling place for the investor — and should remain so for some time.